The island was the backdrop of the 2012 film Beasts of the Southern Wild, an allegorical fantasy about the impacts of climate change through the eyes of a small child. The cameras have left, but the islanders who remain are confronted with the real-life consequences of a warming climate, threatening to wipe out what remains of their traditional way of life. Most of the men on Isle de Jean Charles, young and middle-aged, work the water, casting nets to trawl for shrimp and oysters. Such has been the way for the Biloxi-Chitimacha, the small Native American tribe who first settled on the isle in the 1840s and carved out an existence amongst its swamps and marshes. But that existence, and way of life, is now in jeopardy. Where 200 Biloxi-Chitimacha families once lived, fishing, trapping and rearing cattle, only 24 remain. “There was land on both sides of the bayou,” said Chris Chaisson, pointing out the window of his SUV parked just at the head of the island road. “Now, it’s just open sea.” Chaisson, 30, spoke to us about coming to church on the isle as a child by way of pirogue, a long, open fishing boat native to the region. Oil outfits, digging extensive canals to lay pipelines crisscrossing southeastern Louisiana, have left behind a maze of slowly widening waterways through which the Gulf is sucking land out to sea. Saltwater rushes into the newly-dug pipeline ditches, killing freshwater vegetation, loosening the earth for the sea’s advance. “Living off the land is impossible now,” said Albert Naquin, 64, the brim of his cap low over his eyes as he speaks to us in a pavilion beside his home in Pointe Aux Chenes, just a few miles inland from the Isle. Albert is chief of the Biloxi-Chitimacha, a title passed down from elders for more than 100 years. There is pressure, he says, from the state government, real estate interests, and even tribal members to relocate. The island – along with the rest of Louisiana’s coastline – is disappearing into the Gulf at a speed almost visible to the eye. Thirty square miles of South Louisiana’s land– an area roughly the size of Manhattan – vanish every year into the Gulf of Mexico. With about a football field being swallowed by the Gulf every half hour, the area is one of the fastest disappearing landmasses on earth. The US Army Corps of Engineers is constructing a 70-mile levee system called the “Morganza to the Gulf Hurricane Protection Project” along the endangered coast. By the time it is completed in 2020, the levee, an $887 million project designed to stem wetland erosion exacerbated by canals and oil pipelines, will protect 120,000 people from hurricane damage. Those on Isle de Jean Charles will not be amongst them. A report by the Army Corps of Engineers said that extending the levee around Isle de Jean Charles was economically unviable. Instead, it suggested relocating the people of the island – at a cost of $8 million – to someplace further inland. It was not until the Civil Rights Act of 1964 that Naquin and his peers were allowed to attend public schools. Even after civil rights legislation was passed, they continued to face discrimination. A line of thin white scars on Naquin’s forearms serve as a reminder of the beatings he was dealt as a child for speaking Cajun French, his mother tongue, in school. He and other islanders see the potential forced removal of the remaining islanders in the midst of a decaying environment as a continuation of this injustice. Yet the sinking isle is emblematic of an environmental crisis that is affecting many more communities than just the Biloxi-Chitimacha. “State and federal Agencies regularly look the other way for the energy industry in the Gulf,” creating an “energy sacrifice zone,” said Scott Eustis, of the Gulf Restoration Network. The massive BP Deepwater Horizon spill four years ago, which spewed oil along the entire Gulf Coast and beyond, devastating the fishing industry and wildlife, is just one example of the results of government turning a blind eye to safety precautions. There are thousands of offshore wells and oil pipelines in the Gulf and, this February, a federally imposed embargo against BP partaking in the region's offshore oil boom was lifted. The Department of the Interior has touted stricter safety measures, but many in the region who depend on the Gulf waters to earn a livelihood want drilling to halt entirely, fearful of the next blowout. Yet, for the the Biloxi-Chitimacha, sea level rise – spawned by heat-trapping greenhouse gas emissions from the oil being extracted in the Gulf and elsewhere – remains at the root of the tribe's most pressing problems. The phenomenon won’t affect only the Biloxi-Chitimacha and their isle. Coastal areas around the world are under threat. 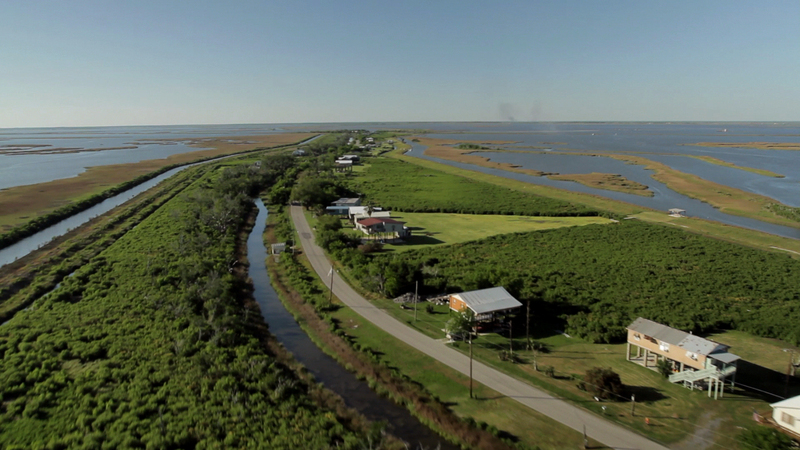 The Biloxi-Chitimacha stand on the front-lines of this ecological transformation. If and when the time comes to leave, Billiot says, moving the graves from the burial ground will be out of the question.